Two months ago today, I moved to New Jersey. If someone had told me years ago that I'd one day be living here, I'd never have believed them. I grew up in a smallish town in the Midwest, middle Indiana to be precise, directly across from one of the ubiquitous cornfields dotting the Midwestern countryside. My hometown, at least while I was there, boasted maybe 3,000 residents. Today it's closer to 23,000 and is basically a suburb of Indianapolis. Personally, I find this grossly unfair. I mean, they have a movie theater, for crying out loud. Where was this when I was a teenager?? But I digress. When I was an adolescent, I couldn't have imagined all the different places in which I'd find myself over the years. True, I tended to be "take one day at a time" sort of person and so didn't really think about it one way or the other, but when you grow up in a fairly insulated and conservative town, it's often difficult to think past one's limited experiences anyway. I stayed in Indiana for college and grad school after which I found myself unexpectedly transported to a whole new universe in Memphis, TN--the South. I felt like an alien in a strange land and, in many ways, I was. I spoke too quickly, I moved too fast, and I refused to say "y'all" on general principle. I was introduced to real-life cotton gins that looked nothing like the little box in my childhood history book. Eventually I adapted; I spoke a little more slowly, drank sweet tea, and even picked up the odd regional colloquialism, though I still avoided "y'all" as a matter of course; no doubt it will be "you guys" till I die. Ultimately I came to love Memphis and I still think of it as my home. Besides, Memphis brought me some of the biggest joys of my life, including the birth of my amazing and brilliant daughter and the opportunity to travel overseas not once but twice, for which I will be eternally grateful and because of which I want to travel even more. 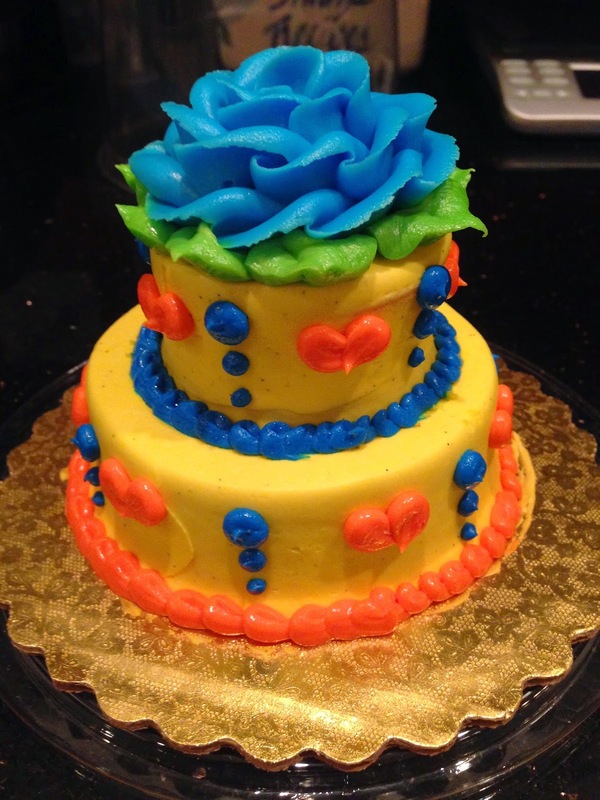 After nearly 20 years in Memphis I moved to Georgia because of the Spousal Unit's job. Georgia was quite the adjustment considering the girlie went to her first year of college just 3 weeks after we moved and we'd just lost 3 of 4 parents in the previous 4 years--never mind a number of other things complicating the move. In the process, I soon learned the difference between the South and the Deep South and that I don't really belong in it. I made some fantastic friends in my short time there, but I never really fit in otherwise. And that's okay. It was a good place to discover how much more liberal I am than I'd originally thought and to better understand who I am overall and what I think after years of focusing on other people. Four years later, just when I was getting used to the place and able to find my way around, we moved again and I ended up on the Jersey side of the Philadelphia metropolitan area. I find this particularly ironic because when I was a kid, my family used to drive all over the country visiting relatives. By the time I graduated from high school I'd been in most of the contiguous states at one point or another, with the exception of the northeastern US so naturally that was the region I was most curious to visit. 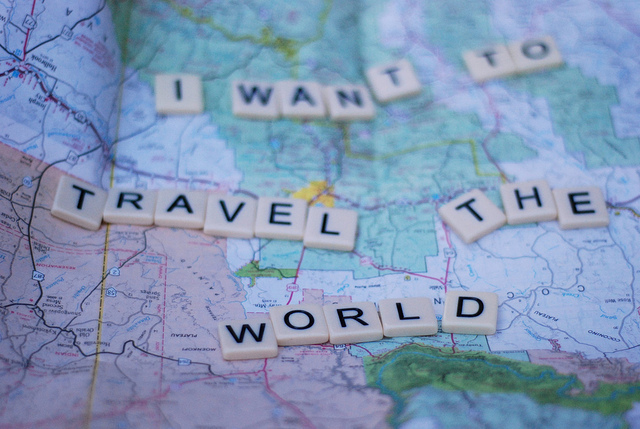 Well, that and Alaska. Then the girlie unexpectedly chose to go to school in NY, so I got to see a little of the Northeast for the first time--and now I live here. That's kind of exciting, really. In fact, I'm even planning a new blog that will focus on my explorations of both Philadelphia and the Northeast in general; hopefully it will be launched in the next month or so. And what's a new blog without a small preview? In the process of running around like a crazy person while trying to sort out things like driver's licenses and plates and registrations the first two weeks and after myriad jaunts to home improvement stores, I've picked up a few things about my new home. 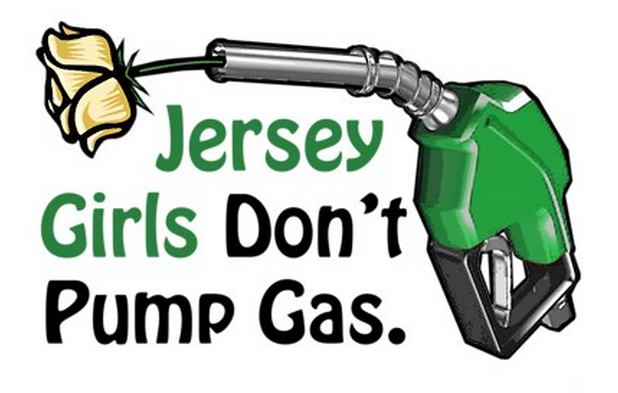 So here, in no particular order, are ten things I've learned about New Jersey so far. 1. The people here are surprisingly friendly. No, I didn't think everyone was going to be a rude, overly-tanned mafioso, but I did expect a certain degree of terseness and directness in speech that is largely absent in the South. And while everyone does tend to be more straightforward here (which is great, because I always have been too; it's one of the many reasons I don't make a good Southerner), I was still surprised by how just how polite and open everyone seems to be. 2. It is illegal to pump your own gas here. I've been pumping my own gas since I started driving approximately 5 centuries ago, so it's more than a little weird to hand over my credit card to a complete stranger and sit in my car while he hooks up the pump. I confess I keep eyeballing the card reader in case someone wanders by to try yanking it out of the slot. On the other hand, I can see the potential advantages of being forced to stay in my car when it's rainy or snowy outside, so there's that. 3. Speaking of gas, it's cheaper in New Jersey than in Philadelphia which is good because it's pretty much the only thing that's cheaper here. I knew going in that the cost of living up here was much higher than in the South or the Midwest, but frankly I'm still in sticker shock at just exactly how much more expensive it is. It's daunting, to say the least, and kind of makes me want to knock over an armored truck just so I can squirrel away some reserves. 4. New Jersey has something called "jug handles." And I'm not talking milk pitchers. Jug handles (which constantly make me think of "Jug Ears" from the British show "Are You Being Served") are a bizarre means by which one makes a left-handed turn on the road. I've actually done a couple now (mostly successfully), and they still seem to me to be overcomplicating the streets but then I'm just a misplaced Midwest-Southerner so what do I know? Just in case traffic wasn't convoluted enough. 5. There are no Kroger's or Publix grocery stores here; instead one of the big chains is Acme, which I cannot look at without immediately seeing Wile E. Coyote holding a cardboard box and hearing "Ac-Meeeeeeee" playing on repeat through my head. 6. New Jersey is surprisingly green, and I don't just mean all the trees and grass. (And, can I just say? Fescue, how I've missed you! So soooooooft...) In my township, most of the lampposts have solar panels installed and the recycling program here is rather extensive. 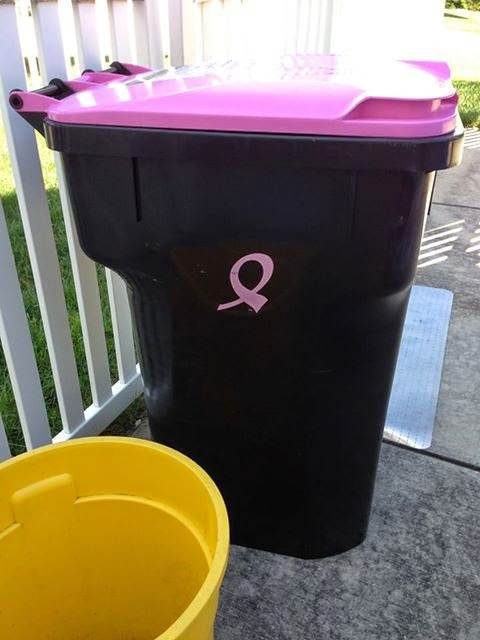 Residents are even provided with a big recycling dumpster, thoughtfully emblazoned with the breast cancer support ribbon...but you have to provide your own trash cans. Go figure. 7. I may not live at the epicenter of US culture, but I can access a significant majority of it within four hours or less. NYC is maybe 2½ hours away, and Washington D.C. is maybe 3½. I'm also only about an hour from the shore should I get the inexplicable urge to expose my pasty flesh to the sun's harsh rays. And it's the shore, not the "beach." That's one change that's going to take some getting used to. Meanwhile, I'm a scant 20 minutes from the "Cradle of Liberty" that is Philadelphia, as well as its myriad museums. 8. While I'm pleased to be living above the fire ant line once again and can actually do yard work without the imminent threat of my extremities blowing up like inner tubes or burning as though doused in habañero juice, my car and I are both somewhat less than thrilled to be back in the Land of the Eternal Pothole. I may mock native Southerners' aversion to cold weather with the best of them (not that I won't soon be whinging here after 23 years of relatively hot winters), but I have to admit that the roads are much easier to traverse without all the cracking and expansion brought on by frigid temperatures. Also? I haven't picked up a snow shovel in nearly a quarter of a century. 9. 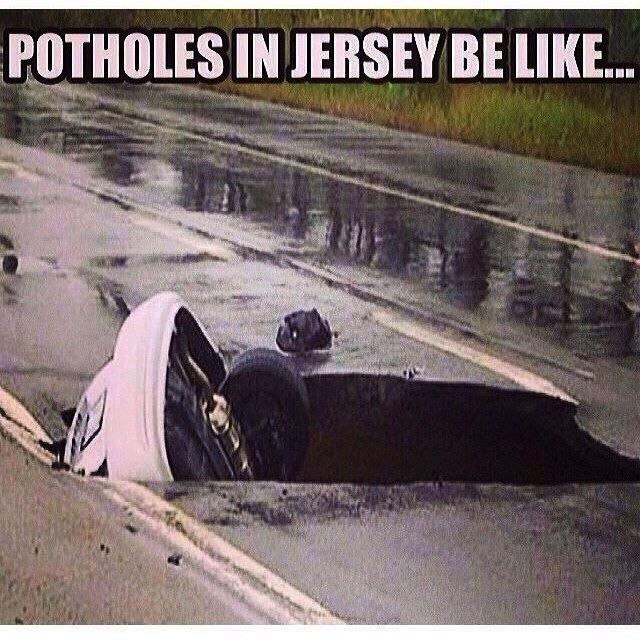 Furthermore, I've learned that summer in New Jersey means rain and lots of it. I don't know yet if that's typical or if it's just this summer, but either way, I really wish my neighborhood's power lines could handle the strain a little better. Seriously--you'd think if the electric company knows there's going to be a problem every time it storms they'd spring for proper repairs rather than going through their giant box of magic electricity bandaids to jury-rig the outages. Still, that seems a small price to pay for significantly more temperate summers than I've had for the last 2 decades. And while I dread surrendering my beloved flip-flops in favor of grown-up shoes this fall, I am totally down with hot cocoa and tea and cider and sweaters and cozy fires and trees that actually change more than two colors in the approximately 3½ days which constitute "autumn" in the Southern region. Apparently my Celtic roots are showing. 10. Lastly, New Jersey has my phone's GPS completely flummoxed. I've been using the Tomtom app for several years now and, barring the odd exception (and parking lots), Paul's done quite well for me. No, I didn't name him; the voice options came pre-named. A few years ago when relatives were visiting, I was demonstrating the different voice and language selections. I landed on an Australian voice designated as "Paul" ("That's not a knife...THIS is a knife!"). Eventually I got so used to Paul's voice that now all the other voices sound somehow wrong. At any rate, Paul can't seem to manage New Jersey at all and consistently smokes silicon motherboard crack when plotting out my various destinations. I've been told that others have similar problems with their GPS when in New Jersey. I'm not sure why this is, but even Google Maps gives me better directions. Yet if I cross back over into Philadelphia, Paul is good to go once again. I can only assume that Australians have some sort of ocean-based enmity against Atlantic dwellers. Or something.